First up is the Charlotte Tilbury Bronze & Glow highlighter. As you can see from the swatches, this is the most subtle of the bunch, and is great for that soft 'lit from within' look - see this look. The powder is super finely milled and works on all skin types and ages. It is the most expensive at £49 but you do also get a fantastic contour powder, which you can see I've used a lot! Secondly is my favourite everyday one from the bunch - The Balm's Mary Lou-Manizer. It's a gorgeous light golden shade that looks gorgeous on every skin tone, but especially paler skin. It has a hint of silver in it which means it still shows up on pale skin and doesn't look too gold - see this look. It's such a bargain at £16 (but you can get it for £13.60 from Look Fantastic!) and I've had mine for years and still have loads left. It's very glowy, but I find it to be gorgeous for everyday as it doesn't look the slightest bit glittery or over the top. Next up is my very over the top shade - Makeup Forever's Star Lit powder in 13. This is very metallic and is really a pigment more than a specific highlighter, but I honestly love it to get that very strong highlighted look. I know it's not for everyone but I love it! 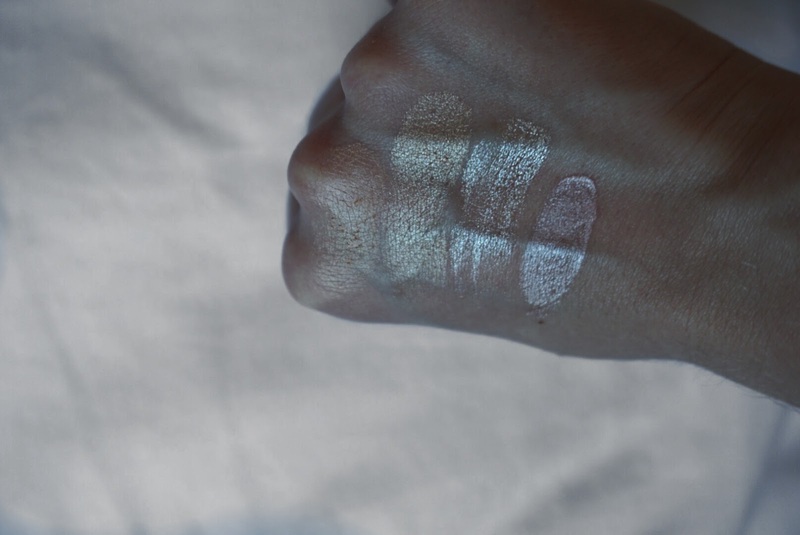 It's very pigmented, so be careful when applying as a little really does go a long way. Also because the shade is so light, it works perfectly with pale skin again - you can see it in this look here (notice how it's not as unwearable as you might first think! ), and it's also the highlighter I used in my most recent Instagram with the blue lower lashline. You can grab a pot from Debenhams for £13 (although you may have to hunt it down - since Jaclyn Hill mentioned it on her Snapchat it's been pretty hard to get hold of!). 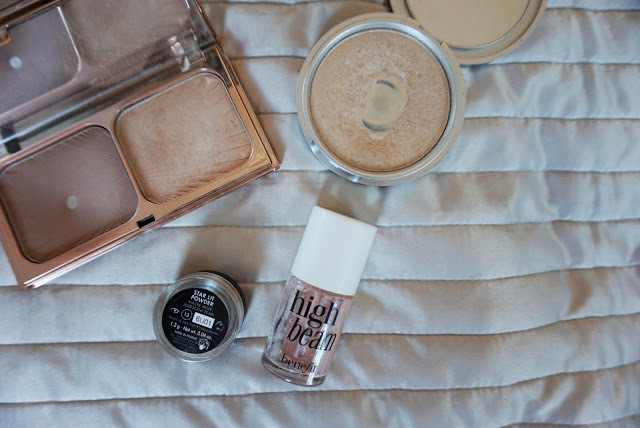 Finally, my liquid highlighter option - Benefit's High Beam. I've had this for years (as you can probably tell by my bottle of it!) and this is a beautiful pearly pink toned highlighter. You can mix it into foundation or apply as a regular highlighter - I personally like to top it off with a powder highlighter but you don't have to! It gives a very natural sheen to the skin, as it's a liquid so is great for drier skin or a more natural makeup look. As it's more pink toned, it works well with paler skin and again you only need the tiniest bit to get a gorgeous glow - I personally don't apply straight from the brush and usually dab some onto my finger so it blends into the skin a little bit easier. So I hope this post was helpful - I always like to see what works on different skin tones so hopefully my experiences with highlighters will help someone else out too! Let me know if you have any of these, or what you fave highlighters are below - I'm definitely a highlighter junkie so always looking for more to try!